In Indian classical music, both Hindustani and Carnatic, drone is considered to be an essential accompaniment for the musician. The drone produced, most commonly using a Tanpura ( तानपूरा in Hindi) (tambura in Carnatic tradition), serves the all important function of helping the musician stay on their pitch. In case of Bansuri, even if the player is an expert, the sound being produced can have pitch variations depending upon style, force and angle of blowing during a playing session. Also, during a long playing session the player may get fatigued and loose pitch in the process. Having reference tone playing in the background can come in real handy here to help the bansuri player stay latched onto the tonic pitch or Sa. Tanpura serves this purpose very well as it not only provides the root note Sa but also another note - specific to the particular raga being performed, usually Pancham or Pa (the fifth note). Besides these, Tanpura produces a whole range of rich natural harmonics (jawari in Hindi). Tanpura normally has 4 strings. The 1st one tuned to Pa (sometimes ma, Ni or any other note important to the raga being played). The 2nd and the 3rd to second octave Sa and the 4th to tonic Sa. Tanpura can be as tall as 60" or as small as 30". The long neck portion of Tanpura is made of hollowed out wood and the round bottom of dried gourd. The 1st and the 4th string can be made of Bronze or Brass depending on the pitch range of Tanpura. The middle two are mostly steel. Having Tanpura as an accompaniment is not absolutely necessary in case of string instruments like Sarod and Sitar as the instrument is tuned to the tonic SA each time prior to playing, thereby 'freezing' the tonic pitch. And the pitch is not really affected by playing style. 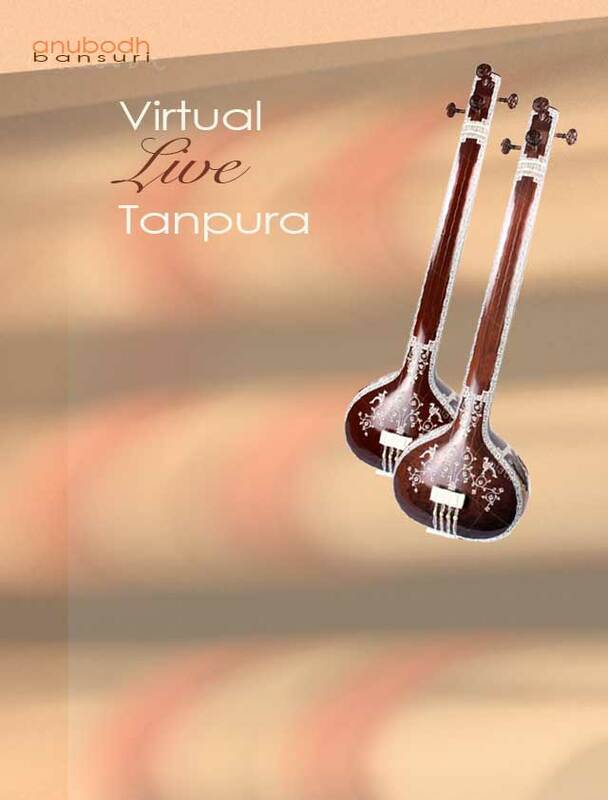 Here is Virtual Live Tanpura for you to practice / play Bansuri with. It is constructed with high quality Tanpura recordings and allows you to choose your Sa out of the twelve notes of an octave - just with a click of your mouse! The strings of this Tanpura are tuned to a reference of A=440Hz and are in the most common configuration of Pa Sa Sa Sa. You can, of course, use the Virtual Live Tanpura for vocal or any other accompaniment also. Hope you will enjoy playing along with it.